With the end of the year so rapidly approaching, I am in the process of tying up loose ends and wrapping up my first full school year. I am excited and pleased with the data I'm collecting so far in regards to how the program ran this first year. I wanted to evaluate the program this year for a couple of reasons: 1) to help me and my advisory council plan for next year 2) to include teachers in the process and encourage buy-in 3) to share with my administration what I have been doing this year and how it has been received. I searched some school counseling blogs that I follow and ASCASceneIt for ideas of what I wanted to include in my staff survey. Ultimately, I wanted to evaluate the program and get a fresh perspective of our students' needs. I created a short, 10 question survey that I emailed out through SurveyMonkey last week and I have gotten tons of positive feedback from teachers. I am excited and humbled that they feel so good about the direction that this program is headed in. This first year I was able to really create the foundation for a program-- we have a mission, vision, philosophy and curriculum which I created and have been working with school wide. Next year, I will do more trying to get everyone to buy into the program as more than just "what Kristi does" and help teachers see the impact that integrating it with what they already do can have on behavior, classroom management and the well-being of our students. You can see the questions that I asked below. Most were on a scale of strongly agree to strongly disagree with a few multiple choice and free response sprinkled in. Although SurveyMonkey has limitations for what you can use without upgrading, I found it to be very useful for what I was hoping to accomplish. It was very easy and user friendly both for myself and my teachers! I also really wanted to show the incredible staff that I am blessed to work with how much I appreciate them. However, being that there is only 1 of me, it can be hard to do this on a budget. 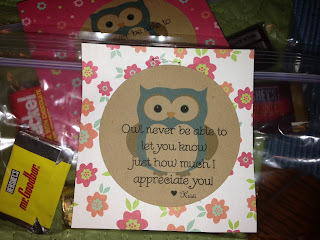 So, I created these little goodie-bags and placed them in their boxes. I bought the stickers at Wal-Mart and downloaded the template from the packaging. 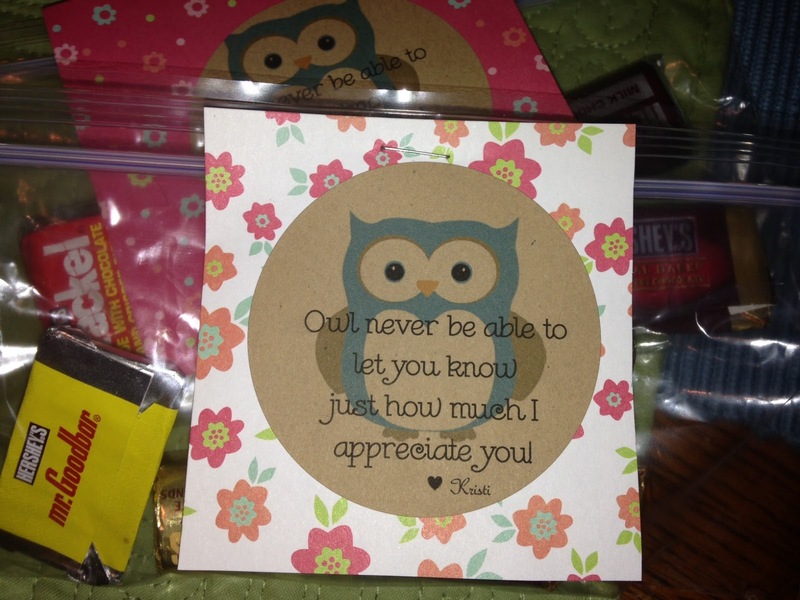 From there, I just inserted a picture of an owl, chose the cutest font and printed them. I stuck them on squares of scrapbook paper and stapled them to baggies filled with candy and viola, a little treat for the teachers and staff! This has been such a wonderful year all in all. Definitely full of ups and downs, but even in the downs I know that I absolutely feel called to be where I am right now doing what I do. I am a school counselor at heart! I love getting to work with the sweet kiddos that we have here at school and as much as I'm ready for summer, I know I will miss them and worry about them for the next 75 days. Good luck to all of you as you finish up your years!